What's Really Happening With The Japanese Yen? The Japanese Yen is making headlines, again. The Dollar-Yen trade pierced through the 110 support level and the Bank of Japan's credibility is at stake. It's only a matter of time before the BoJ swings its "sword" and slice rates again, or at least, so it seems. But while Yen strength has caused quite a stir in Japan, its origins, this time around, are rooted elsewhere. Wall Street is flat, European bourses are falling and China isn’t out of the woods just yet. Japanese corporates keep hoarding cash and, of course, they need to park it somewhere. That “somewhere” is their default choice; i.e. repatriate the cash and buy into the safety of Japanese Government Bonds. As illustrated in the chart, when comparing the Bloomberg Japan Sovereign Bond Index with S&P500 and Nikkei 225, demand for Japanese Government Bonds has been strong. 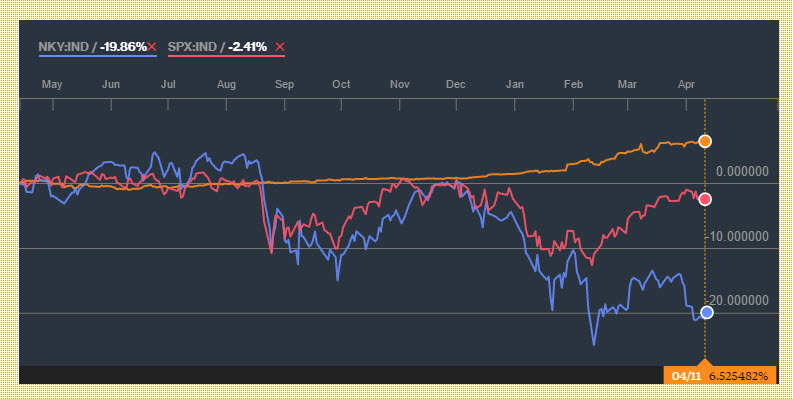 Japanese Government Bonds beat both the S&P500 and the Nikkei 225 for the passing year. And that’s even more interesting when you consider the negative yields—it actually costs to hold Japanese Government Bonds. How long can Japanese corporates keep repatriating funds and pay for the "privilege" to hold Japanese Government Bonds? Since Japanese Government Bonds actually charge investors for holding them, the only way investors can hope to gain is if the flight to safety keeps pushing bond prices higher. They cannot hope to gain interest income, as they do when holding US Treasury Bonds. And that strategy can’t hold water for very long. Once risk appetite returns and stock markets start gaining again, there’s no reason Japanese corporates will continue to buy bonds that charge interest rather than pay. Corporates will, once again, store cash elsewhere and then the appetite for Japanese Government Bonds will fall and with it, consequently, the Yen. In other words, when stock markets start rallying again and the global economy improves then the latest Yen rally will fade. While the mood among investors is still rather gloomy, the likelihood of risk appetite returning is much closer than it seems. Since my last review on China, Manufacturing PMI surged above 50, which suggests that China’s economy is stabilizing. In the United States, the next rate hike has been kicked further back. And yet, the US job market remains resilient, posting 195K of gains in nonfarm payrolls. At the same time, retail sales figures are up by an impressive 3.1% year-on-year. Even if America is growing slowly, the growth engine is still there. In the Eurozone, the picture is perhaps the most complex. The latest PMI data on Manufacturing and Services plunged and so did the ZEW Economic Index, an important gauge for the Eurozone. Still, other signs suggest a reason for modest optimism. Retail sales nudged higher by 2.4% year on year, and GDP growth stabilized at 1.6% year-on-year. But perhaps most interesting is the latest developments in the credit sector; the growth of loans to the private sector is accelerating. That suggests that the ECB’s massive €80Bln of monthly bond purchases is finally, albeit gradually, drilling down into the banking system. Usually, when loans grow it eventually transforms to higher growth. If those three trends continue, it won’t take long for Japanese corporates to divert their funds back abroad. Furthermore, carry traders, who take delight in the negative rates, will find their confidence restored. They’ll begin to borrow Yens and buy currencies with higher rates, the likes of the Dollar, the Pound Sterling and, of course, the Aussie. The hit for the Yen will be especially hard because its strength is reliant solely on risk aversion. It is a mini-bubble that, while it won’t likely cause any repercussions for institutions, will definitely hit Yen buyers that couldn’t escape quickly enough. And what if the Bank of Japan decides to slice the deposit rate further into the negative? Then the bubble burst will be even harder. I like the yen but didn't know underlying reasons for its move.